To close the register a user must be first logged into a register by the “Login” screen. To then close the register, press the “Main Menu” button, which is located at the top, left hand corner of all main transaction-processing screens. 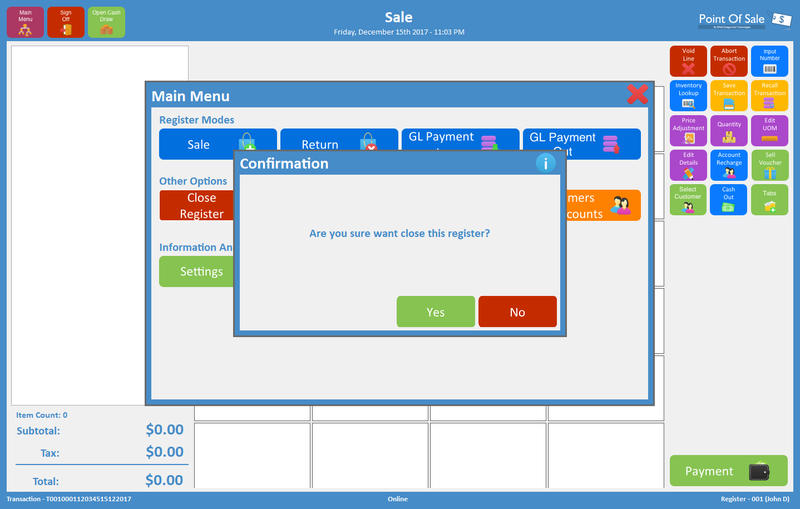 In the “Main Menu” screen the user should then select the “Close Register” button. Upon pressing the “Close Register” button, a user will be prompted to confirm that they wish to close the register. Select the “Yes” button to close the register. Once a user selects “Yes”, a user will then be presented with the “Closing Register Float” count screen. This all in one screen is where both the closing float amount is entered in and all manual tender amounts are reconciled. A user selects the type of cash or other tender type they wish to reconcile from the left hand side. Upon doing this, an option to the right hand side of the screen will appear, for any physical/manual types of tender. A user then inputs the tender total they have on hand into the relevant text box. Once all tenders have been reconciled, press on the “Close Register” button. A user will be asked to confirm that they have finished counting. If this is right select “Yes”. 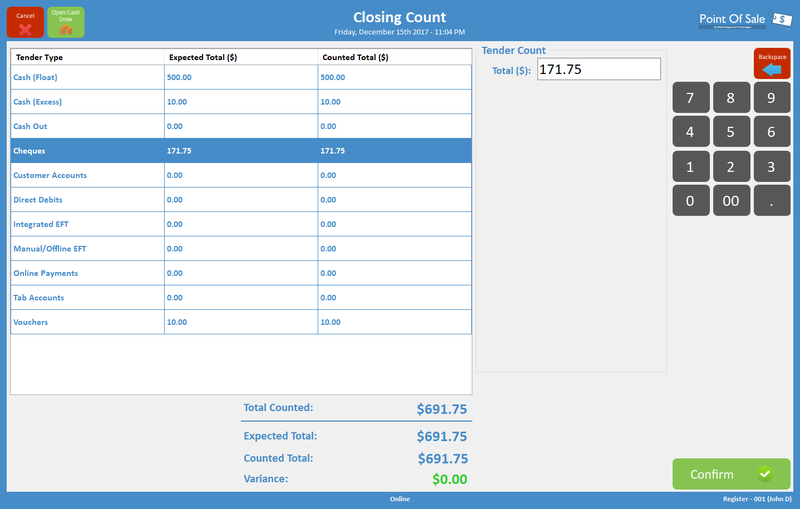 Upon pressing the “Yes” button, the register will now shift totals and synchronize with the OnePortal. 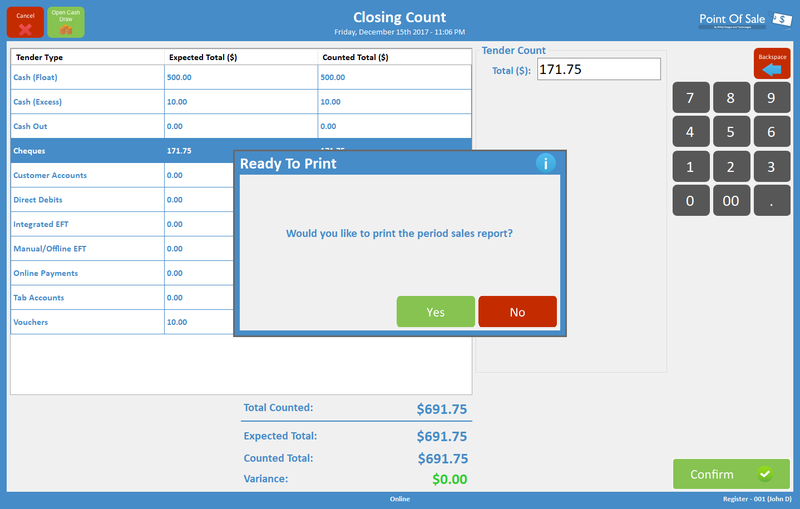 The system will then prompt to print the “Period Sales Report” for the period. If a user presses the “Yes” button this report will print via the receipt printer. The user is then taken back to the “Login” screen. The register period has now finished and if more sales are needing to be processed for the day, the register will need to be reopened.